CUMMINS UNIT, Ark. 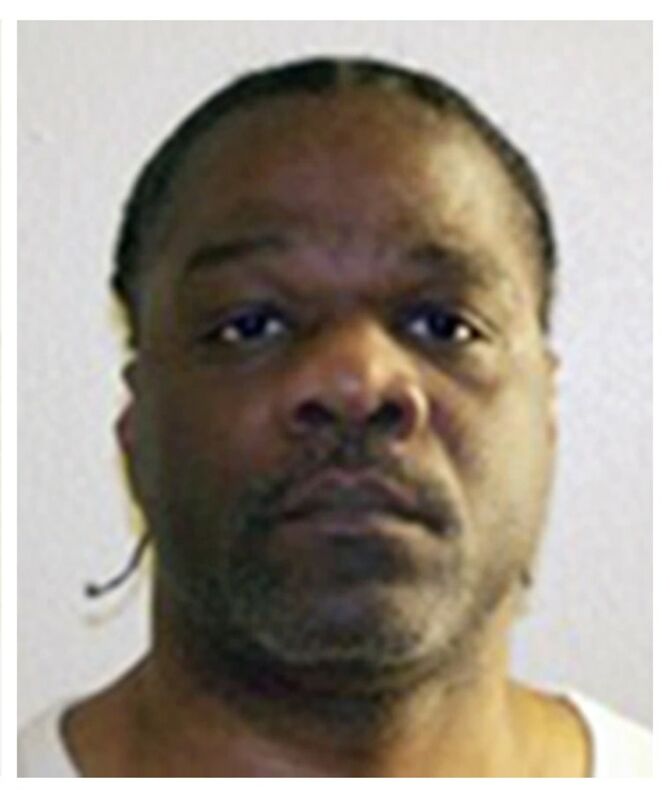 — The state of Arkansas executed death row inmate Ledell Lee late Thursday, its first death sentence in more than a decade and the first of four inmates scheduled to die before the end of the month when a crucial lethal injection drug is set to expire. The U.S. Supreme Court declined to hear five last-minute appeals by Lee's attorneys to stay his execution, which began at 11:44 p.m. CT (12:44 a.m. ET). Lee was pronounced dead at 11:56 p.m., Arkansas Department of Correction Director Wendy Kelly said. Lee, 51, was sentenced to death in October 1995 in Pulaski County, Arkansas, for the murder of 26-year-old Debra Reese. He declined to make a final statement, officials said. Three media witnesses reported that Lee remained under sedation during the procedure. “His last meal request was that he receive communion, and he was given communion this afternoon,” Department of Correction spokesman Solomon Graves told reporters. Because communion — a bread wafer and a small amount of wine representing the body and blood of Jesus Christ — was not a full meal, the Department of Correction offered to provide a meal on his behalf to the rest of the prison population. Lee declined. The execution caps days of legal jostling by Lee's defense lawyers and attorneys for the state of Arkansas over the state's right to use a paralytic as part of its lethal injection cocktail. A court OKd the drug earlier Thursday. Also part of the lethal injection drugs used on Lee was the controversial sedative midazolam. Arkansas's store of the drug is set to expire at the end of the month and is what triggered the Department of Correction to plan an unprecedented string of eight executions in 10 days this month. Midazolam has also come under fire for its reported lack of effectiveness in some instances. The sedative is supposed to render death penalty inmates unconscious and unable to feel pain during their executions, but in cases in Oklahoma, Alabama, Arizona and Ohio in recent years, inmates were reportedly conscious and showed signs of extreme pain. Some experts say midazolam isn't a heavy-duty anesthetic and doesn't stop inmates from feeling pain — violating the constitutional protection against cruel and unusual punishment. But a divided Supreme Court in 2015 ruled that prisoners did not prove the drug entailed "a substantial risk of severe pain." Defense attorneys for Lee successfully delayed his execution several times with a handful of last-minute filings. "At the last minute, it seems like a lot of throwing stuff at the wall and seeing what sticks," the governor's spokesman, J.R. Davis, said earlier. Faced with a number of legal hurdles, Arkansas won an unexpected victory in the early evening allowing it to move forward with Lee's execution at 7 p.m. CT (8 p.m. ET) on Thursday. The state Supreme Court sided with state prosecutors and tossed out a restraining order that a county court on Wednesday night had placed on Arkansas's use of the paralytic vecuronium bromide — one of three drugs in the lethal injection cocktail. Pulaski County Circuit Court Judge Alice Gray had originally placed the restraining order on the drug because McKesson Medical-Surgical, a pharmaceutical company, claimed that the Arkansas Department of Correction had duped them into providing 100 vials of the vecuronium bromide. But Arkansas Attorney General Leslie Rutledge appealed the case to the state Supreme Court, which overruled Gray’s decision, though it did not provide an opinion. Reporters from The Associated Press, Arkansas Democrat-Gazette, and ABC affiliate KATV were chosen as media witnesses an hour before the procedure was to take place. At the last minute, the 8th U.S. Circuit Court of Appeals, put Lee's execution on hold for 75 minutes. It was unclear which issue the court was debating. Lee's defense team had earlier in the day requested a stay to prove his innocence through DNA testing. The U.S. Supreme Court then delayed the execution for 10 minutes and later, the appeals court halted it for another 45 minutes. Arkansas Gov. Asa Hutchinson had originally scheduled eight death row inmates to be executed at the end of April, but that plan has hit numerous roadblocks. So far, the state has been forced to allow three death warrants to expire and a court stayed an additional inmate’s execution. Meanwhile, the Attorney General's Office announced that they will not move forward with an appeal of the stay for Stacey Johnson, the second inmate who had been scheduled for execution Thursday night.